I send information through my blog SapporopPop Life about SapporoPop's open days. 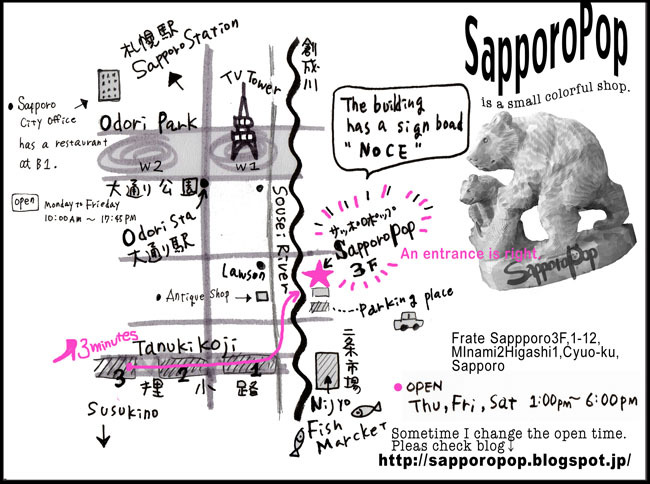 22artists gathered at the depertment"Marui Imai"
JAN 25~29 SapporoPop is going to open at the department"MARUI IMAI Icijyo-kan 9F"
Near the Nijyo fish market.The pink big bilding has a signboard"NOCE" SapporPop is in 3F. 「映画とおしゃれ」イラストエッセイ展 About Eriko Kwamura's exhibitions. I have two exhibitions at SapproPop and Sapporo city office's restaurant(b1). 3 October to 13 October. 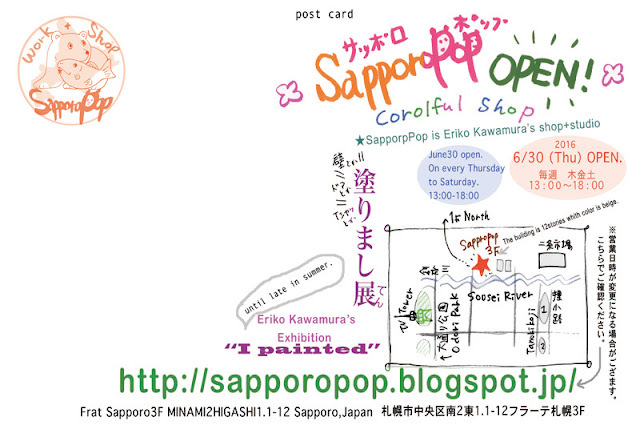 ★On Saturday,August 13, SapporpPop is closed. 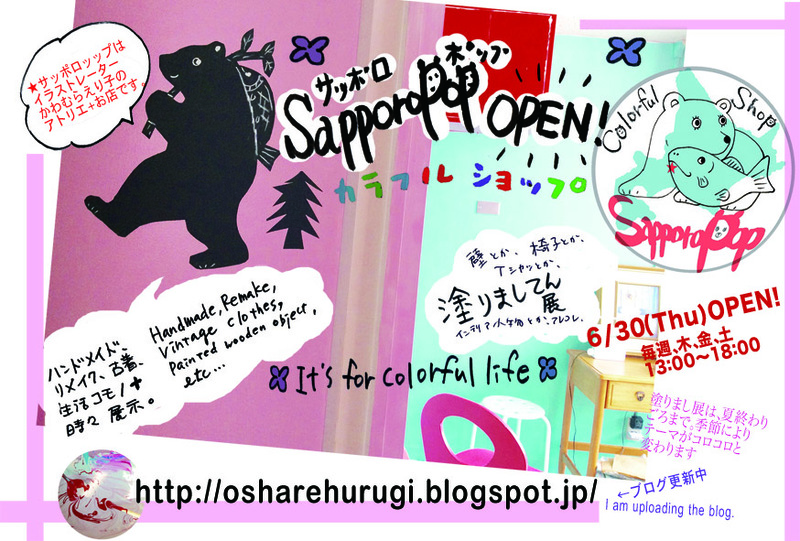 I'm going to open the SapporoPop Colorful shop in 30 June. They are made by wood carving. 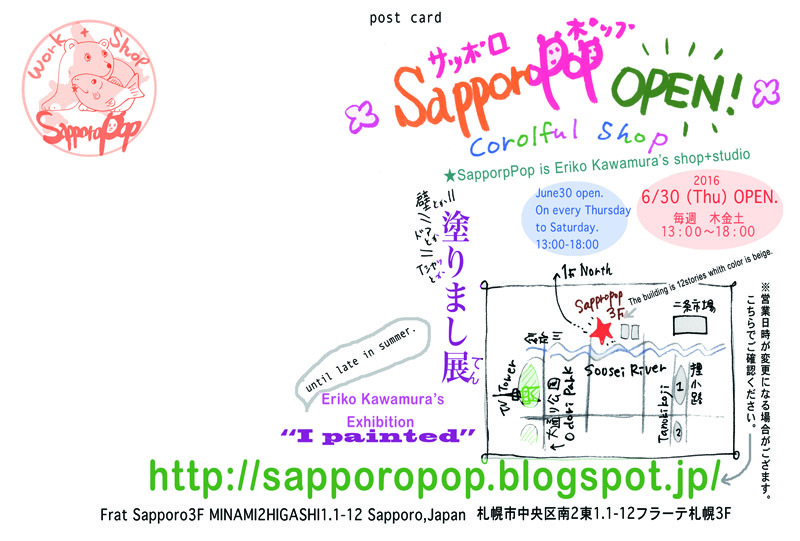 I'm going to have a exhibition about "Eriko's painting "until end of summer. I painted the wall,a door,chairs,some T-shirts, some dress. 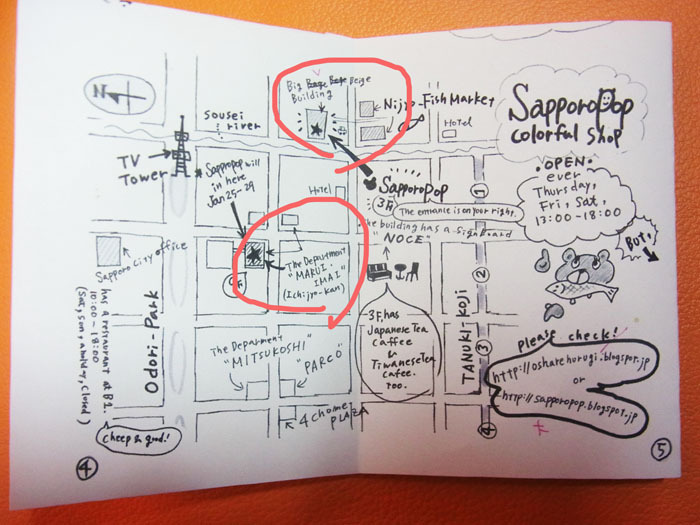 The SapporoPop on the third floa in the big pink beige buildeig where has the interior shop at first floor. An entrance is on your right. Near the Nijyo Fish marcket. You can meet the bears at the Tanuki-Koji1. 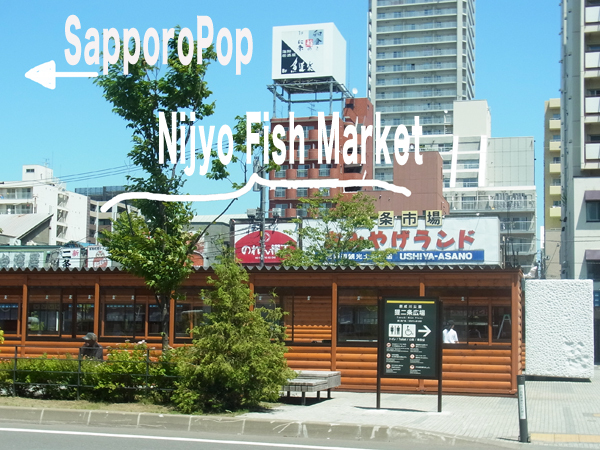 If you through the Tanki-Kouji 1, you can see the Nijyo Fish market. Turn to the left at front of The Nijyo Fish market. You can see "NOCE" where is an furniture shop. SapporoPop is the third floor. 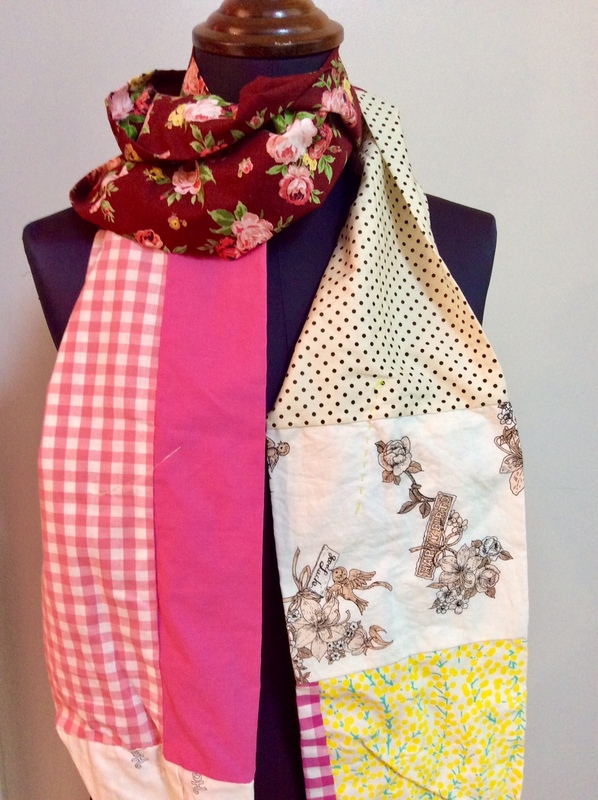 I sell Japanese vintage cloth,Kimono jacket,Hokkaido's souvenirs which colorful design. SapporoPop is for the colorful life. Sometime I made collage clothes. I used vinteage Japanese clothes and new clothes. The wooden bear carving with a salmon is famous mascot of Hokkaido. Because Hokkaido's bear eat the salmon. 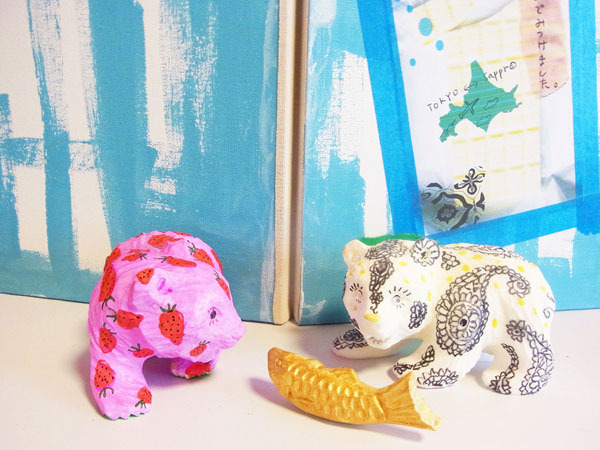 I made colorful small bear and salmon which we can paint. KIPORY is mascot of SapporoPop. 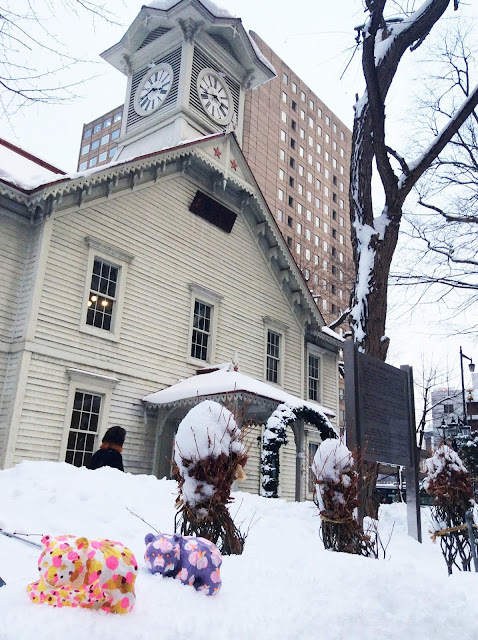 Sapporo is a snow country in winter. The clock tower is a symbol of Sapporo. There is a Eriko's studio and shop.